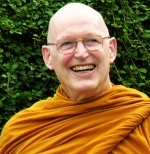 Ajahn Sumedho of Amaravati Monastery in Hertfordshire, retired last year. Adorably known as Luang Por, he was the oldest monk in Europe at the age of sixty (60 !!! .. too young to be the oldest !!! in Asian standards) when I visited Amaravati back in 1996.